It's looking like a coat! 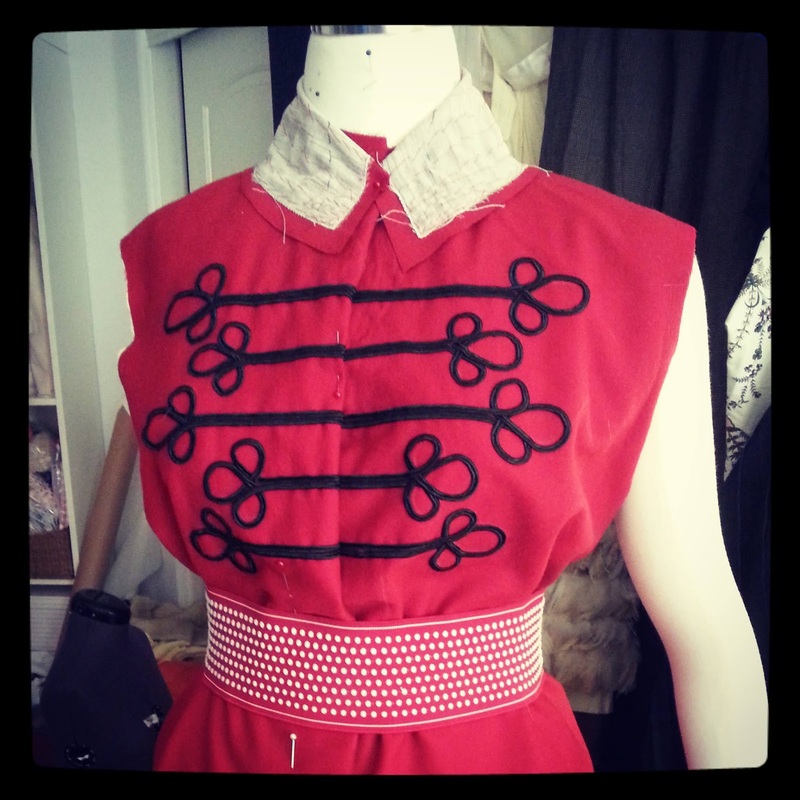 The belt around the middle is just there for mocking up, and is tighter than the final belt will be. Things are going together really quite well on my "Red Russian Doll" project. 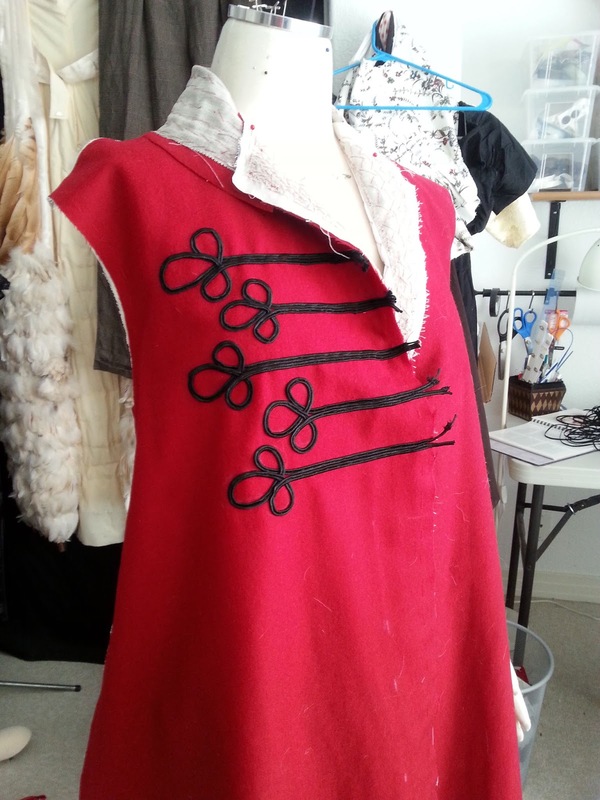 I have the back and front pieces together, and it's starting to look like a coat, but there was a lot to be done before making it just this far. I pulled out my Gertie's New Book for Better Sewing and followed the tailoring instructions. The first step was to cut interlining - cotton muslin - to flat-line all the wool pieces, giving the fairly thin wool structure. 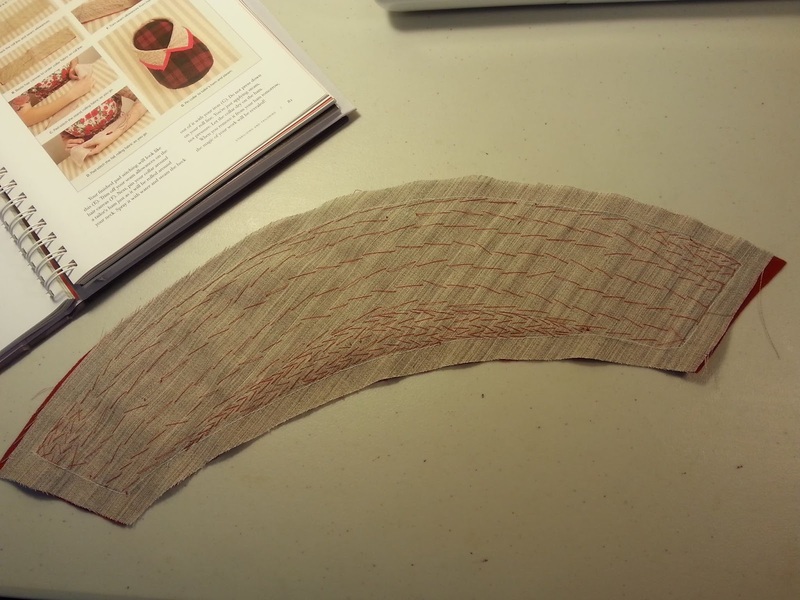 This worked beautifully for the soutache braid, which needed something to keep it from weighting the wool too much. Pad stitching the collar, according to Gertie's book. Then to the soutache! 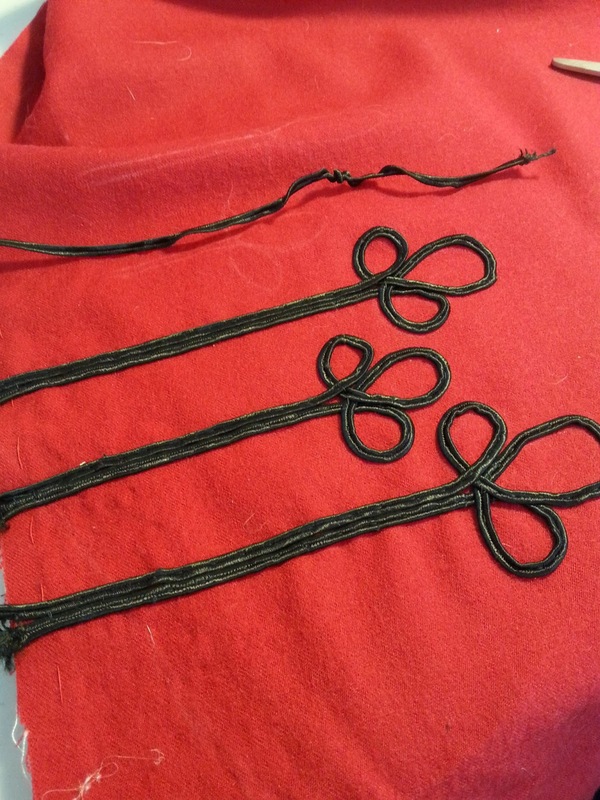 I wanted to do one continuous piece of braid for all the decoration on the front, but pulling the little interior cord to get the loops to lay flat turned out to be a pain for a long, unspecified length, so I did each design singularly. It was a little tedious, but didn't take as long as I thought it would. I did the soutache design on my computer, printed it out, and pinned it up to see if it was a good scale. 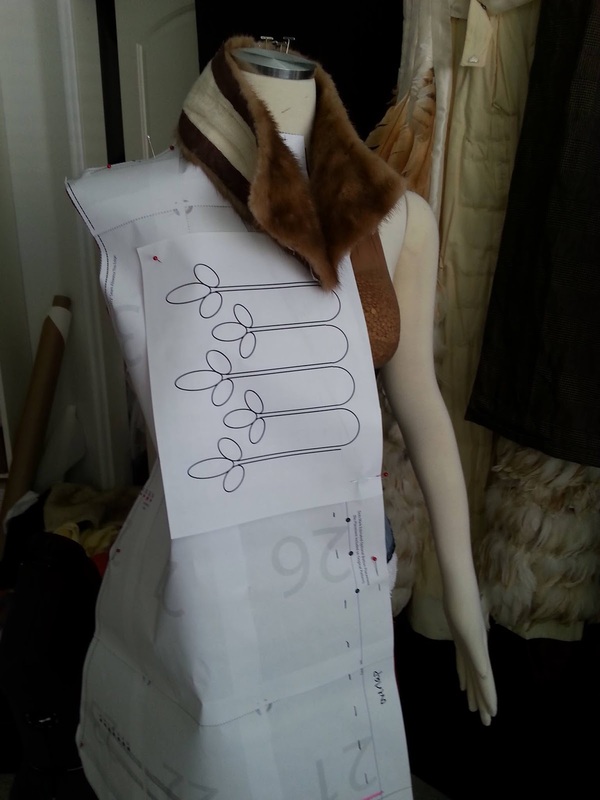 Working the braid - I marked the design in chalk, the stitched the soutache on by hand. 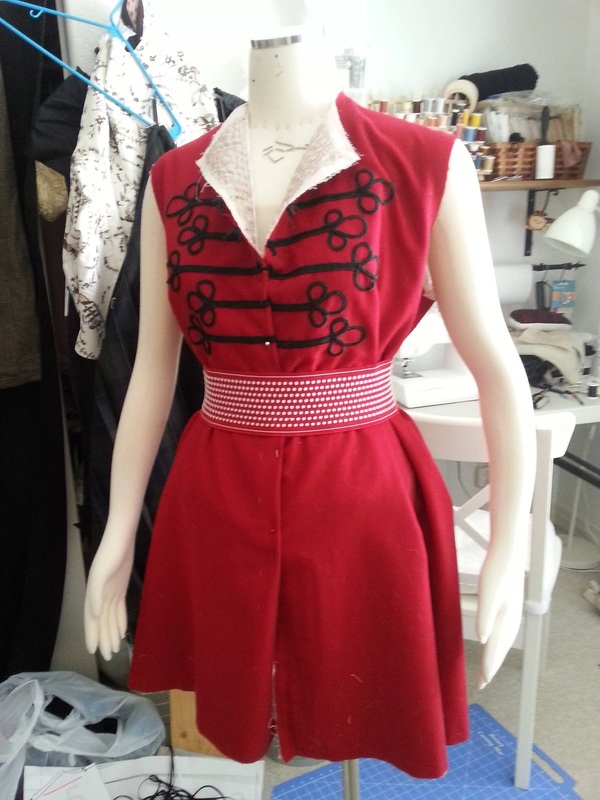 I did not pin this before working it, just shaped the loops and stitched it as I went. Both side applied, and I just folded and pinned the jacket front pieces to mock up how it might look when finished. Cut it with a knife, and from the wrong side. This allows fewer hairs to be cut and sprinkled all over your floor. I know there are ways to not have the hairs caught in your seams, but I don't remember how to do that. Maybe the Dreamstress has something? I saw some more detailed advice about sewing seams in faux fur, but now I can't find it; if I do, I'll comment again. Good luck! Right now it looks like an awesome swimsuit! Can't wait to see the finished product!